The map has decorative borders illustrated with the Elements and illustrates the misconception of California as an island. This map has had repairs to the centerfold. This has been professionally done by an acknowledged expert, to museum quality, and they do not detract from the beauty of the map. 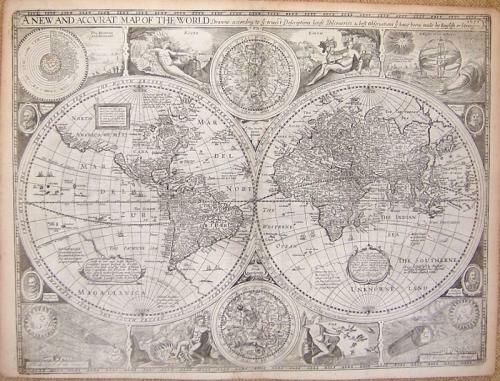 Specifically, the map has had approximately 1 cm replaced along the entire centerfold in facsimile (ie redrawn by an expert with reference to the original). This is remarkably well done, and it is accurate and hardly noticable - but it would trouble the purist.